Beautiful Mr & Mrs Wreath Cushion, the perfect way to celebrate a happy couple who love to cuddle up on the sofa! 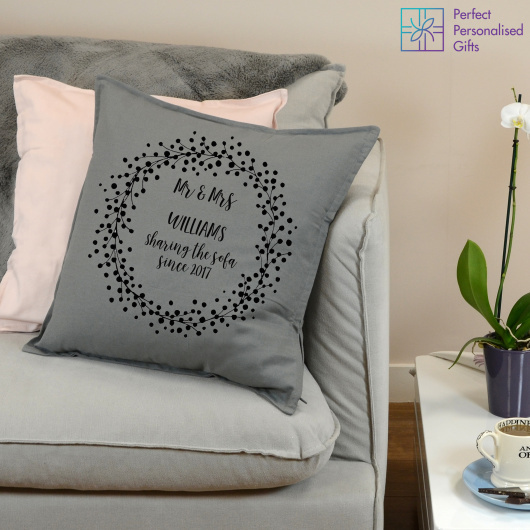 This Mr & Mrs Wreath Cushion is the perfect gift for any happy couple! 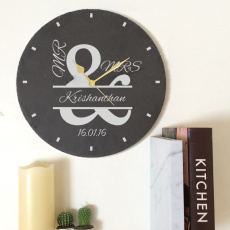 Personalise this wonderful gift with the family name and special date to make it truly unique. Whether it’s for a newlywed couple or for an anniversary, this gift can be given for many different occasions! These grey cotton cushion covers will stand out as a statement piece on the sofa with its beautiful wreath design. The text ‘Mr & Mrs’ and ‘sharing a sofa since’ is fixed text. This beautiful cushion is made from 100% cotton and measures at 50cm x 50cm. You can buy the cushion cover only or the cushion cover with the cushion insert. Shopping last minute? Don’t worry, just select next day delivery when you order!